Iranium-Can we let Iran Go Nuclear ? Iran's nuclear program presents a threat to international stability. Yet successive American administrations-Republican and Democratic alike-have misread the intentions and actions of the Iranian regime. Iranium documents the development of Iran's nuclear threat, beginning with the Islamic Revolution of 1979 and the ideology installed by Supreme Leader Ayatollah Khomeini. Iranium tracks Iran's use of terror as a tool of policy, beginning with the 444 day seizure of the U.S. Embassy in Tehran, through Iran's insurgent actions in Iraq and Afghanistan. Iranium details the brutal nature of the Iranian regime to its own citizens, and the Iranian people's desire to rejoin the international community. In order for Iranium's important message to have maximum impact, we need YOUR help. Click here to find out more about how you can take action. This "interview" was broadcast yesterday in the USA. In an exclusive interview with ABC "World News" anchor Diane Sawyer, the Iranian president also scolded the U.S. and other nations that have threatened sanctions against Iran unless it reins in its nuclear ambitions and submits to international inspections of its nuclear facilities. "They tell us. 'Let's negotiate.' Then from the other hand, they are saying 'sanctions are coming.' They show the stick. "Respectable lady," Ahmadinejad said, "this approach has failed... raising the stick of sanctions and then saying let's negotiate. It has failed. It's over. It's not repeatable." Ahmadinejad rejected evidence that Iran is working on a neutron initiator, a device which has no civilian uses but is the trigger for a nuclear weapon. It was first reported in the Times of London which cited an internal Iranian document. The plans for a neutron initiator has been described as the "smoking gun" that allegedly proves Iran's nuclear program is intent on building a bomb. This is a serious piece of news, with solid evidence to back it up. Once again the world is walking into a period of procrastination and denial. The BBC reports, as shown on Press TV, the Iranian Governments English language propaganda channel that Iran has successfully test-fired an improved version of a medium-range missile. TV pictures showed the launch of the Sajjil-2 rocket, which experts say has the range to be able to hit Israel and US bases in the Gulf. Correspondents say it is not the first time this missile has been tested, but the timing is likely to add to current tension over Iran's nuclear ambitions. The West says Iran is trying to build nuclear weapons, a charge Iran denies. The US said the test "undermined Iran's claims of peaceful intentions". "Such actions will increase the seriousness and resolve of the international community to hold Iran accountable for its continued defiance of its international obligations on its nuclear programme," a White House spokesman said. UK Prime Minister Gordon Brown said the missile launch could boost the likelihood of further sanctions against Iran. "This is a matter of serious concern to the international community and it does make the case for us moving further on sanctions," he said. The French Foreign Ministry said the launch was "very worrying". "A test of this kind can only strengthen the international community's worries at a time that Iran is also developing a nuclear programme with no identifiable civil objective in violation of five United Nations Security Council resolutions," spokesman Bernard Valero said. In September, Iran was heavily criticised after testing its Sajjil and Shahab missiles which could travel 2,000km (1,243 miles). Those tests came just weeks after Iran revealed the existence of a previously secret nuclear facility in the mountains near the city of Qom. Like the missiles tested in September, the missile launched on Wednesday uses solid fuel in its two-stage rocket. Solid fuel rockets can be prepared for launch in less time than those using liquid propellant rockets. BBC defence correspondent Nick Childs says the government's refinements to its rocket programme will increase tensions over Iran's nuclear ambitions. The six nations negotiating with Iran on that issue want to prevent the government from enriching uranium to weapons-grade. Iran has declared it will open 10 more nuclear sites and enrich uranium to a higher degree than it has publicly announced before. Peaceful intent? Nuclear power for civilian purposes? We don't think so. On Tuesday December 15th, Dr Mohammad Saeedi, the deputy head of planning for the Atomic Energy Agency of Iran (AEOI) and a member of Iran's nuclear negotiation team for the past five years resigned. Saeedi is the second senior member of AEOI who has resigned since the reelection of Mahmoud Ahmadinejad in June this year. The first was Mohammad Reza Aghazadeh, who was the head of the organization. Although no official explanation has been provided, it is quite possible that Saeedi's resignation could be related to the infighting currently taking place within the Iranian regime. After Ahmadinejad's reelection, Iran's supreme leader Ali Khamenei started a purge in the Iranian government. Many of those who were reformists or moderate conservatives were pushed out. For those who survived the cull, Iran's refusal to accept President Obama's recent offer, and the impending sanctions and isolation which it will bring, could be a huge disappointment. This is especially true for Iran's nuclear negotiating team. Dr Saeedi would have seen how, for years, Ali Larijani, Iran's senior nuclear negotiator masterfully delayed major sanctions for Iran by negotiating with the EU and Javier Solana. Since Larijani's resignation in 2007, Iran's position has significantly worsened. His replacement, Saeed Jalili is far less capable in terms of diplomatic skills. Furthermore, Supreme Leader Khamenei does not want to make any compromises. If anything, Iran is now far more provocative than before. See Ahmadinejad's announcement that his government plans to build 10 new enrichment facilities, in complete defiance of UN resolutions. Under these circumstances, Iran's nuclear negotiation team has become all but redundant. Dr Saeedi would be forgiven for thinking his job is done. (IsraelNN.com) Secret documents obtained and translated by the Times of London reveal that Iran has been working for two years on a plan to test a nuclear bomb component that triggers an explosion. American intelligence experts previously had denied Israeli reports on Iran’s nearing nuclear capability. 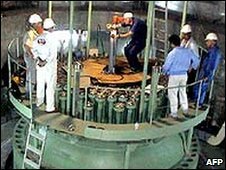 They claimed that Tehran in 2003 had halted preparations to make nuclear weapons and would not resume work on the project before mid-2007. The United States earlier this year admitted its information was incorrect. Mark Fitzpatrick, senior fellow for non-proliferation at the International Institute for Strategic Studies in London, told the Times, "The most shattering conclusion is that... this was an effort that began in 2007…. If Iran is working on weapons, it means there is no diplomatic solution. The technical document describes the use of a neutron that independent experts say have no use other than for a nuclear weapon, according to the Times. The documents have been transferred to the International Atomic Energy Agency (IAEA), the nuclear watchdog arm of the United Nations. The U.S. Congress is pressing for tougher sanctions on Iran in a bid to cripple its economy as a way to force it to allow United Nations officials to inspect its nuclear facilities. U.S. President Barack Obama has pursued a strategy of diplomatic pressure.